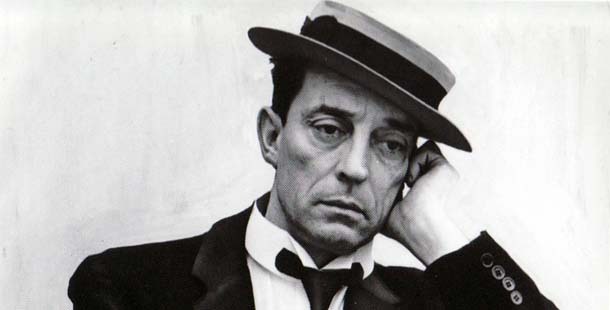 Buster Keaton is considered one of the greatest comic actors of all time. His influence on physical comedy is rivaled only by Charlie Chaplin. Like many of the great actors of the silent era, Keaton’s work was cast into near obscurity for many years. Only toward the end of his life was there a renewed interest in his films. An acrobatically skillful and psychologically insightful actor, Keaton made dozens of short films and fourteen major silent features, attesting to one of the most talented and innovative artists of his time. Born in 1895 to Joe and Myra Keaton, Joseph Francis Keaton got his name when, at six months, he fell down a flight of stairs. Reaching the bottom unhurt and relatively undisturbed, he was picked up by Harry Houdini who said the kid could really take a “buster,” or fall. From then on, his parents and the world knew him as Buster Keaton. By the age of three, Keaton joined the family’s vaudeville act, which was renamed The Three Keatons. For years he was knocked over, thrown through windows, dropped down stairs, and essentially used as a living prop. It was this training in vaudeville that prepared him for the fast-paced slapstick comedy of the silent movies. When, in 1917, his father’s drinking broke up the act, Keaton moved to Hollywood, where a chance meeting brought him contact with another former vaudevillian. Roscoe “Fatty” Arbuckle, one of the most famous of the comic actors of the time, took Keaton on and showed him the ropes of the movie industry. For the rest of his life, Keaton would acknowledge Arbuckle as one of his closest friends and his greatest influence. With his deadpan humor and exceptional acrobatic technique, the lanky Keaton was a perfect partner for Arbuckle’s clumsy antics. The audience agreed, and within a few years, Keaton had acquired the notoriety to move out on his own. The bulk of Keaton’s major work was done during the 1920s. Writing, directing, and staring in these films, Keaton created a world unlike the other comic stars of the times. Where Harold Lloyd battled physical adversity trying to make it to the top, and Charlie Chaplin avoided catastrophe through luck and good will, Keaton was an observer, a traveler caught up in his surroundings. He often found himself in the same compromising circumstances as Chaplin and Lloyd (chased by an angry crowd, left behind by a train), but he maintained a sense of even composure throughout. No matter how lost or downtrodden Keaton seemed to be, he was never one to be pitied. The NEW YORK TIMES said of him, “In a film world that exaggerated everything, and in which every emotion was dramatized and elaborated, he remained impassive and solemn, his poker-faced inscrutability suppressing all emotion.” It was this “stone face,” however, that came to represent a sense of optimism and everlasting inquisitiveness. In films such as THE NAVIGATOR (1924), THE GENERAL (1926), AND THE CAMERAMAN (1928), Keaton portrayed characters whose physical abilities seemed completely contingent on their surroundings. Considered one of the greatest acrobatic actors, Keaton could step on or off a moving train with the smoothness of getting out of bed. Often at odds with the physical world, his ability to naively adapt brought a melancholy sweetness to the films. The subtlety of the work, however, left Keaton behind the more popular Chaplin and Lloyd. By the 1930s, the studio felt it was in their best interest to take control of his films. No longer writing or directing, Keaton continued to work at a grueling pace. Not understanding the complexity of his genius, they wrote for him simple characters that only took advantage of the most basic of his skills. For Keaton, as for many of the silent movie stars, the final straw was the advent of the talkies. Though he acted in a number of films in the ’30s (often alongside Jimmy Durante), Keaton no longer possessed the stoic charm many had grown to love. He worked as an uncredited writer for the Marx Brothers and Red Skelton, eking out a living at a fraction of his former salary. He began drinking and through the ’40s did very little work of serious interest. It was not until 1953, and his appearance in Chaplin’s LIMELIGHT that the public revival of Keaton’s work began. More than simply a nostalgia for the old days, this new interest encouraged Keaton to revive his career with frequent appearances on television. The sheer ability of his acrobatics astounded audiences who had become used to less sophisticated physical comedy, and by the 1960s, his films were returning to the theaters and he was being hailed as the greatest actor of the silent era. In 1966, after finishing work on Richard Lester’s A FUNNY THING HAPPENED ON THE WAY TO THE FORUM, Buster Keaton died at the age of sixty-nine. His career spanned six decades and touched the lives of millions of people. He had worked with everyone from Marlene Dietrich to Samuel Beckett, Cecil B. DeMille to Tony Randall, and had maintained a seemingly selfless composure throughout. For many, this deadpan style was a poignant reminder of the fragility of life in the age of complex and overwhelming machines. 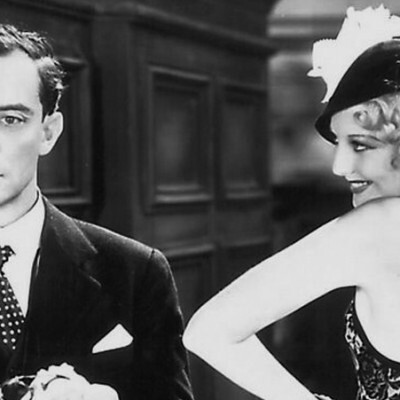 Today, more than thirty years after his death, Buster Keaton’s films seem as funny, touching, and relevant as ever.